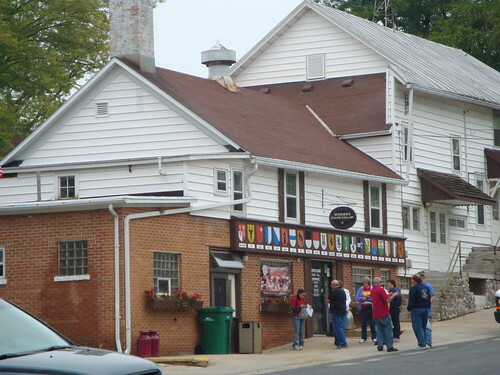 The last cheese factory on our trip was the smallest and most old-school: Widmer’s Cheese Cellars in Theresa, Wisconsin. 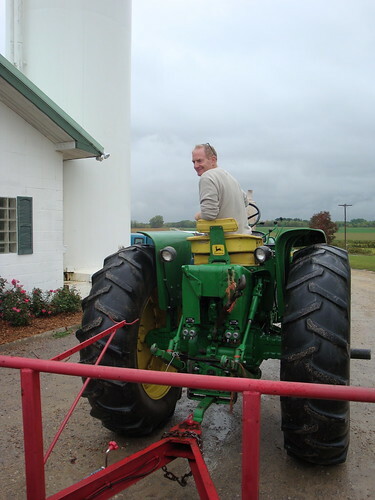 Joe Widmer is a third generation cheesemaker, another Wisconsin Master Cheesemaker and is still operating out of the factory his grandfather bought 80 years ago. The family has finally moved out of the house above the factory, but that’s about all that has changed. I had visited once before (on a road trip in 2005 and I actually can’t believe I didn’t write about it). Joe Widmer is one of my favorite cheese people: funny, friendly, and non-pretentious. 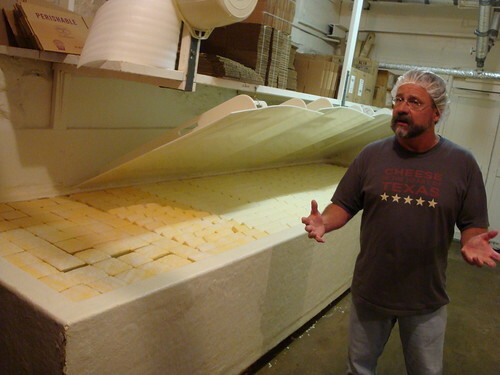 Just look at him standing over the Brick Cheese brine tank! What is Brick Cheese anyway? Why is it called Brick? If you are not from the Midwest you shouldn’t feel guilty about not knowing. Like real Colby, and fresh curds, it’s kind of a regional cheese. It’s another washed rind cheese, very stinky and strong if allowed to ripen to its full potential. Widmer actually makes two versions. They start the same, but one is annattoed up to differentiate it. That (orange) one is plastic wrapped and meant to stay milk. The uncolored one is aged longer and paper-wrapped. It’s as stinky as you want it to be. Why Brick? 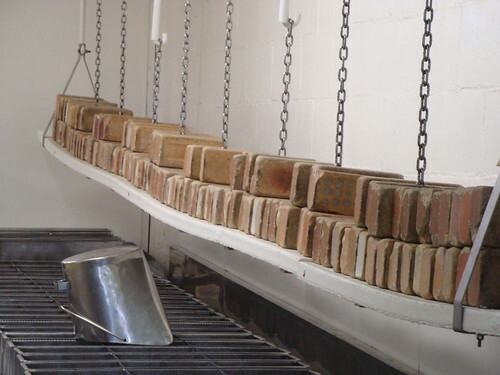 Well, it’s because real bricks were/are used to weight the cheese and push out excess moisture. 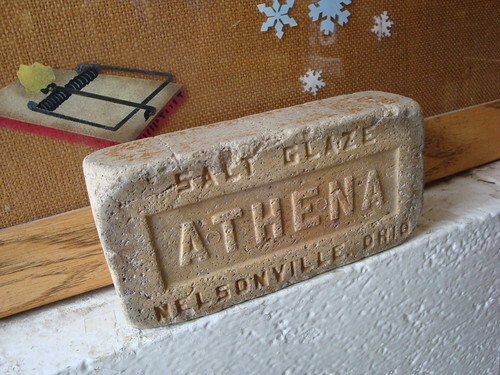 Here’s a third generation brick! Plus the cheese – in a whole block – resembles a brick too. Here it is aging. Please note slimy bacteria on shelves. That’s what makes it great. I don’t know why I started talking Brick cheese so early in this entry since we sell a whole lot more of his cheddar. Joe Widmer is one of the best block cheddar-makers in the country, managing to make very sharp cheddars that remain moist and creamy. Not brittle like Vermont cheddars, with (I hate to say this as a Californian) more flavor than any California blocks I’ve had. Some are scared of the orange annatto coloring to which I say, this is a Wisconsin tradition. Respect diversity! And here is my favorite picture of the trip. 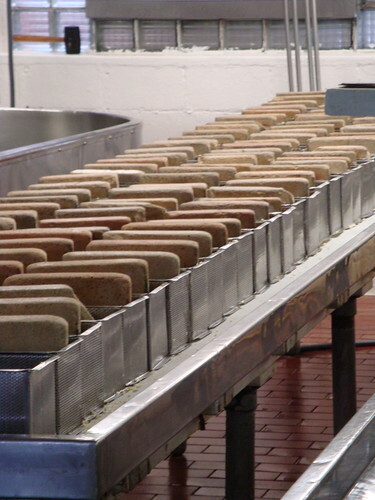 Still life of bricks for Brick cheese at rest. Timeless, eh? The next stop on our journey was Crave Brothers, a farmstead dairy in Waterloo Wisconsin. It’s a big farmstead* dairy – nearly 1000 cows – and they make some of the best mascarpone in the country and one of my favorite American cheeses: Petit Frere. We were too late for the cheesemaking – they were already hosing down the plant – but just in time for the cows. We got slimed by the baby cows who were very excited to see us. 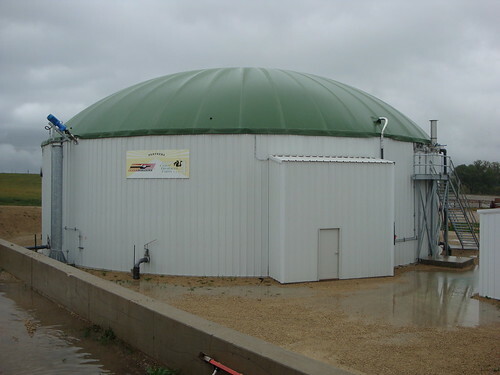 One of the best things about the Crave Brothers farm is that they have the most productive dairy farm methane digester that I know of*** producing all the energy needed to power their cheese plant as well as 120 local homes. **** They titled their press release about this “From Cow Pies to Blue Skies”. Heh. It was an awesome tour. The only thing we didn’t get to see was the manure lagoon. As for their cheese (which I feel funny writing about after typing “manure lagoon” in the last paragraph) I love their little washed rind cheese called Petit Frere (little brother). It’s rich, creamy and – if you let it ripen right – oozy and pungent. I’ve been experimenting around with them at the store and would say give it 60-65 days after the make-date on the box and it will be perfect. 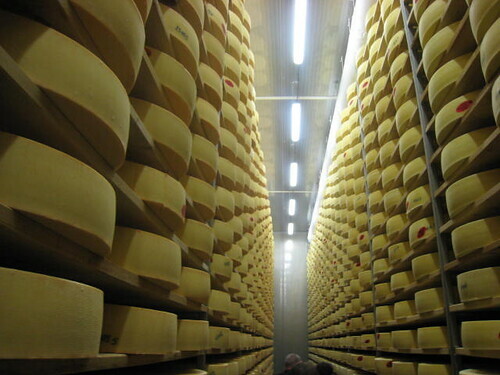 *Farmstead means that the cheese is made on the farm and only from the milk of cows that live there. ** They made a point of telling us that, yes, that was their real name and not a clever marketing ploy “Crave Brothers” could go either way, eh? 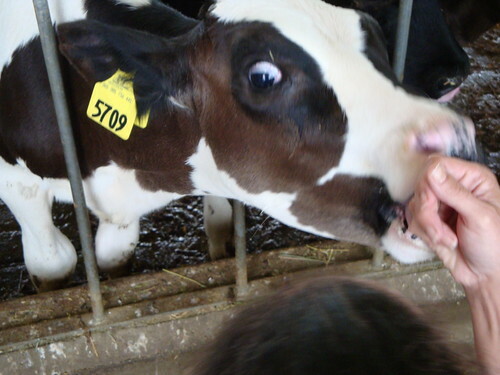 ***Other dairy farms are also doing this. Local dairy heroes at the Straus Family Creamery were – unsurprisingly — one of the early innovators. While I am kind of a whiner in real life, I try to keep it off my blog. I know no one wants to read that. 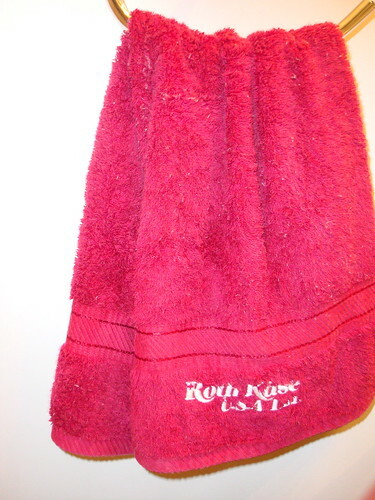 Still, the Cheesemaking day at Roth Kase deserves a little whining. I often work at 7 AM so I don’t mind getting up early. 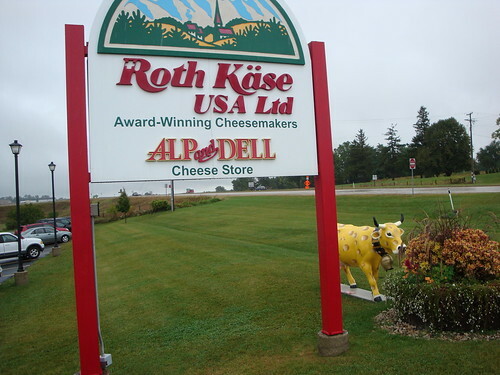 We had to get up at 4:30 to go make cheese at Roth Kase. That would not have been a very big deal except that we were on Wisconsin time so to us it was really 2:30 in the morning. I was so obviously falling asleep on the cheese tour that I became the designation person of ridicule for the entire day. Oh yeah, now I remember why I hated school. 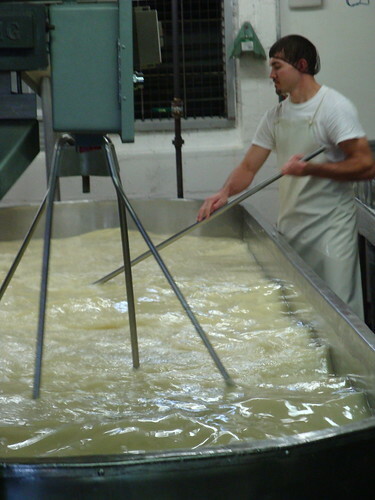 I blanked when asked a question so I had to stand in a cheese corner and write “We leave the vat alone while we wait for the proper PH level and for the curds to knit together,” 100 times. We were supposed to “make cheese” and we did… kinda. * We were a large (exhausted) group doing the work of one person so it wasn’t like we were breaking sweats. We did cheesemaker things though. We cut curd, we took breaks*, we flipped havartis. It was a good day. After making cheese we got to go down to the aging areas. We got to rub paprika into the Gran Queso and – best of all – smear bacteria into their gruyere. It’s always amusing to be in a factory “working” while the real workers get to take it easy and mock from the sidelines. If I did nothing else, at least I made one day easier for a cheese factory worker. Roth Kase gruyere-style cheeses are really something to be proud of. Except for maybe the Pleasant Ridge Reserve (which has only a fraction of the production of Roth Kase) no one widely distributes an American cheese with a Gruyere flavor profile. We got to taste their 15 month-aged cheese and it really is everything you want in a Swiss-style Gruyere: nutty, sweet, oniony, and just a touch of pungency. I didn’t take my camera in at all because I didn’t want to drop it in a cheese vat while I “worked” but I should have more pictures soon. *Don’t worry cheese consumers, the have a couple of old vats segregated from the rest of the cheese equipment for people like us. ( Oh, here they are!) You might eat our cheese, but only if it worked out. **excuse me, we didn’t take breaks, we waited for the proper PH level and for the curds to knit. 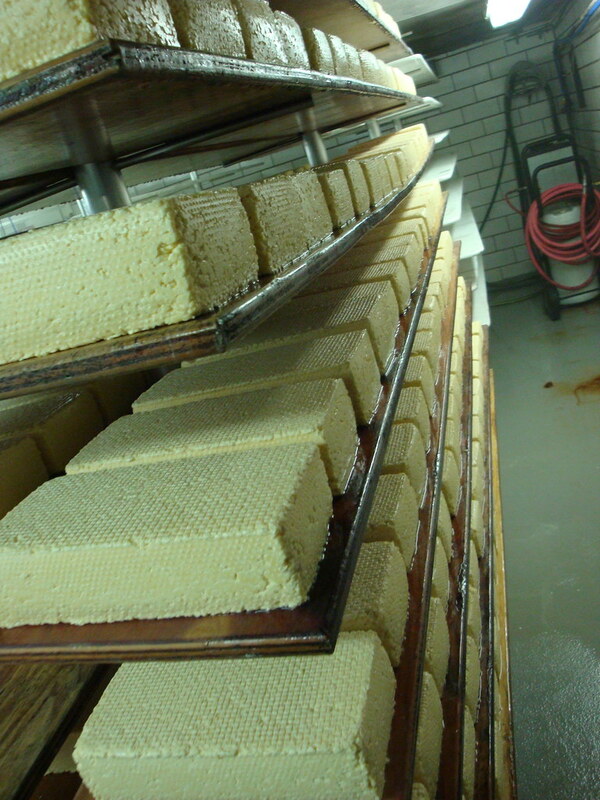 ***I couldn’t give you just a hand towel pic, so here’s a picture of Gruyere de Savoie in a similar aging warehouse in France. The French cheese is about 4 times bigger than the Roth Kase gruyere. I thought I would be bored at the slicing and shredding factory. This part of the tour was definitely organized for Lunardi’s, not us. As a one store operation, we aren’t big enough for private labels or custom blends. Still, I love factories so I was happy to go. Plus we were promised cheese robots! First though, we got to meet more master cheesemakers. Jeff Wideman from Maple Leaf Cheese Cooperative and Bruce Workman from Edelweiss Creamery*. We carry the Maple Leaf smoked Gouda because it’s a natural cheese (unlike most smoked goudas) and I have always admired the Edelwiess Emmenthal, made in copper vats and in 180 lb. wheels like the real Swiss version. However, the most exciting thing about the visit was the revelation that Workman had helped start the Edelweis Grazier Co-op, made up of five farmers doing rotational grazing for pasture-based milk. I had actually already ordered a cheese of theirs without knowing the whole back-story because it tasted so good! In the absence of regulation for “grass-fed” dairy** the Edelweiss Grazier Co-op members agree, by being members of the co-op, to such restrictions as 1.5 acres of pasture for every cow and to not milk at all in the winter, non-grazeable months, giving cows a much needed rest that lets them produce high quantities of milk and live , for much longer than the average dairy cow. While grass-based dairy has obvious health benefits for the cheese-eaters, the farmers, and the farmed, the lack of any unified definition leaves is ripe for abuse in the future. Hopefully we are a few years away from Jack in the Box offering “grass-fed” *** cheese on their “local”,“artisan” ciabatta bread, but that is only as far away as the creation of a sizable market that desires “grass-fed” cheese. I hope the grass-based dairies all over the US can create some kind of agreed upon definition before this concept gets abused. **”grass-fed” meat is regulated, just not dairy. Meat animals and dairy animals have some different needs. I will be on a whirlwind Wisconsin (cow milk) cheese tour so don’t expect any posts from me this week. Hopefully I’ll have good pictures and stories when I get back. I will be back in town in time for the California Artisan Cheese Guild Benefit (held at the San Francisco Cheese School) on Friday night. If you want an evening of cheese eating, cheesemaker schmoozing, and/or something to do before the clubs open, this is well worth the $35. Reserve your spot through the Cheese School (and check out their other classes while your there! ).